After last quarter's severe market sell-off, investors may be considering consumer staples stocks. Consumer staples tend to be more stable and resilient in economic downturns. Thus, for those worried about a possible recession, it may be a good time to look at the best names in the sector. 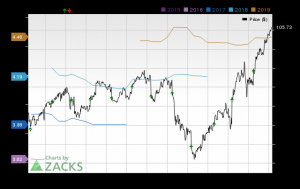 Let's look at two consumer staples conglomerates: Procter & Gamble (NYSE: PG) vs. Kimberly-Clark (NYSE: KMB). Each company has a collection of very familiar household brands. Procter & Gamble, headquartered in Cincinnati, owns brands across five segments: beauty; grooming; healthcare; home care; and baby, feminine & family care. Its big brands include Crest toothpaste, Head & Shoulders shampoo, Old Spice deodorant, Gillette razors, Tide laundry detergent, Pampers diapers, and many, many others. 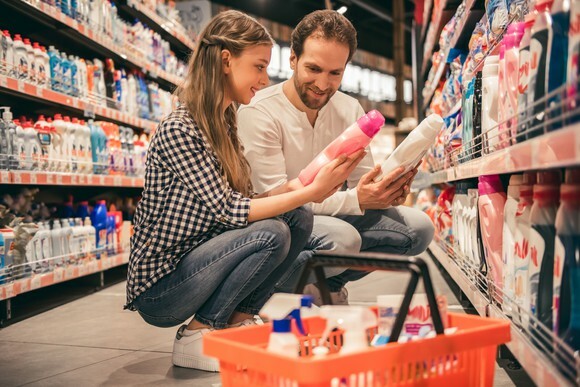 Procter & Gamble is the largest consumer staples conglomerate out there, with a market capitalization of a whopping $230 billion, head and shoulders above the rest (forgive the pun!). Kimberly-Clark, headquartered in Dallas, is much smaller at "just" $38 billion in market cap, but is also the home of many familiar brands, mostly in the paper category. 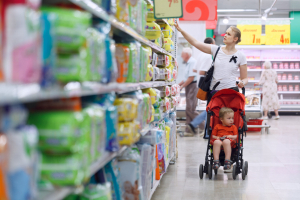 Its main brands include Huggies diapers, Kleenex tissues, and Scott paper towels, among many others. To start, investors should look at each company's growth prospects, dividend yield, and valuation. As you can see in the chart above, despite its size, Procter & Gamble is growing faster than Kimberly-Clark. It also has a higher valuation on a price-to-earnings basis and a lower dividend yield. That's not exactly what one would expect for the bigger company, since the law of large numbers often limits growth prospects and valuations. However, it appears as though Kimberly-Clark's large exposure to paper products is the culprit here. Despite a third-quarter sales decrease of just 2%, mostly due to a 3% foreign currency headwind and 1% organic growth, its gross profit fell by a huge 15% in the quarter, due to an increase in pulp costs and other materials. On the other hand, while Procter & Gamble is battling some of the same foreign currency headwinds and materials costs increases, its more diversified business model means an increase in any particular input (such as pulp) doesn't have as much of an effect on its overall business. That's why P&G's gross profit fell only 2% on flat sales last quarter. These input cost pressures affected both companies' pre-tax profits to an even greater degree. 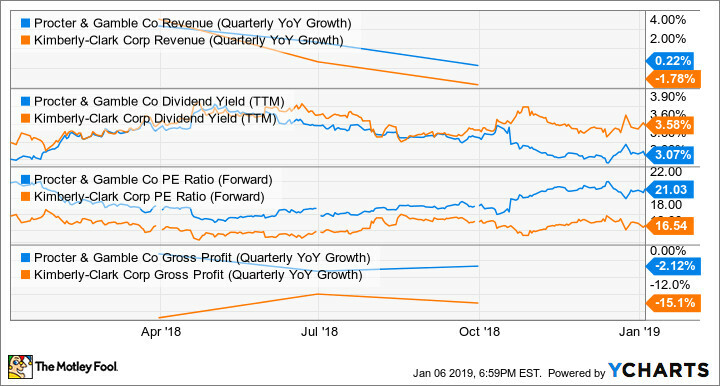 Despite no revenue growth and a gross profit decrease, Procter & Gamble's operating profit was down only 3% last quarter, while Kimberly-Clark's operating income fell a stunning 25% due to cost pressures and currency headwinds! Even without the gross margin impact of input costs and foreign currency, it appears Procter & Gamble is outperforming Kimberly-Clark. P&G's volumes increased 3% last quarter, while Kimberly-Clark's volumes fell by 1%. Why might that be the case? It's hard to say, but I have a theory. Many retailers now provide high-quality private-label goods that often sport much lower prices than big-name brands. I, and probably many others, would be reluctant to try some private-label shampoo, but tissues and paper towels? I think many might opt for the cheaper private-label product. So personal beauty and hygiene products may be more resilient against private labels, whereas there's only so much you can do with paper products to make them better than the lower-cost option. But is it priced in? While Kimberly-Clark does in fact appear to be struggling, its forward P/E ratio of just 16.5 is well below Procter & Gamble's 21. Kimberly-Clark's 3.58% dividend yield is also 17% higher than P&G's 3.07%, which is not insignificant. That could make enough of a difference for some investors, and should pulp costs reverse, that could lead to a similar spike in profitability and upside for Kimberly-Clark's stock. However, if you're going to go for a consumer staple, I would lean toward the safer pick, and wouldn't make a bet on a drastic change in commodity costs. In that case, Procter & Gamble's better diversity, more resilient brands, and better growth and execution make it the stock to pick.